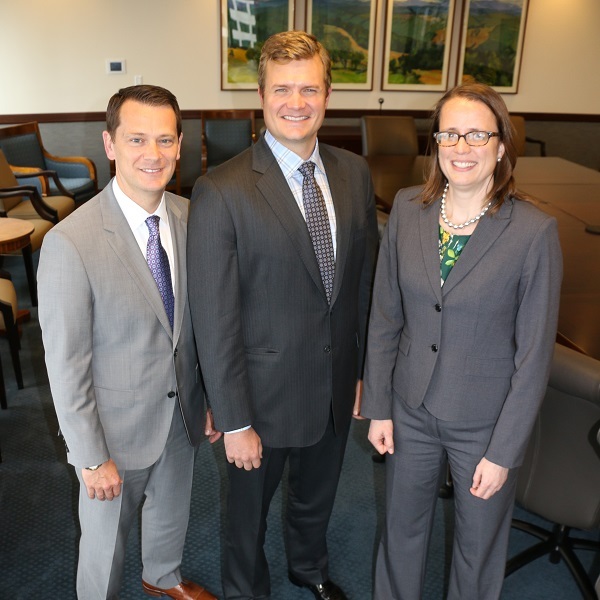 BOSTON, May 9, 2017 – Fiduciary Trust Company, a private wealth management firm for high-net-worth families, individuals, and non-profits, announced today the expansion of its client service team with the hires of James Cosentino and Neal Hegge, both of whom are joining the firm as Vice Presidents and Investment Officers. Fiduciary Trust also announced a key addition to its trust and estate planning team, with Kelly Guarino joining as Vice President and Trust Counsel. Cosentino brings to Fiduciary Trust over two decades of investment experience. He most recently served as Senior Vice President and Senior Portfolio Manager at U.S. Trust, where he created and managed customized investment portfolios for high-net-worth clients. Prior to U.S. Trust, he held positions at Atlantic Trust and State Street. Cosentino received his BA in Finance from Boston College and MBA from Boston College’s Wallace E. Carroll School of Management. Hegge arrives at Fiduciary Trust from Credit Suisse, where he most recently served as a Director in High Yield Sales. In this capacity, he served in a high-level advisory role for large global institutions and investment managers, and raised capital through high-yield bond offerings for public corporations, leveraged buyout transactions and family-owned businesses. Hegge first joined Credit Suisse in 2005, as a Vice President, Hedge Fund Sales, and began his career at Mercer Capital. Hegge, graduated with a BA in Economics from Harvard University. Guarino, meanwhile, joins Fiduciary Trust with over 20 years of legal and estate planning experience. Guarino arrives from law firm Lourie & Cutler where she advised individuals, families, and family businesses on tax, trust, and estate planning issues since joining in 2007. She also held similar roles at Wilmer Cutler Pickering Hale and Dorr, Testa, Hurwitz & Thibeault, and Peabody & Arnold. Guarino graduated with a JD degree from Harvard Law School and earned a BA in Political Science from the University of Utah. Fiduciary Trust takes a personal approach based on expertise, strong performance and a genuine commitment to act in its clients’ best interests. The firm’s unique, private ownership and unconflicted investment approach align its interests with clients’ and provide the stability and permanence its clients seek. For additional information about Fiduciary’s services, please visit https://www.fiduciary-trust.com/, or contact Randy Kinard at 617-574-3432.